Hollybeary Creations : Two Heads are better then one!! Two Heads are better then one!! 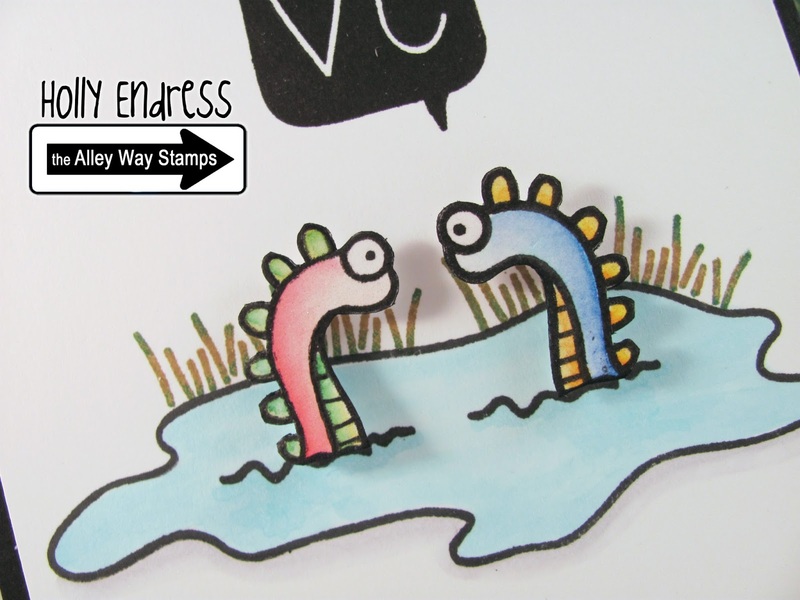 Happy Wednesday everyone.. Today I have a fun card for you using the set Nessie from the Alley Way Stamps. You can get this set free this month with any $40 purchase. Who couldn't love a cute Loch-Ness Monster in their stash? I also used the fun set Spell-Check for the Love Bubble.. This is a fun technique where you create a mirror image with your stamp. I'd like to say this was easy but it was a bit tricky... I remember when this was really popular a million years ago and we only had Rubber Stamps. There was or even may still be a mirror image stamp you can buy just for this technique. But if you don't have that fancy stamp you can use any solid image stamp you have rubber, acrylic or photopolymer. Just stamp the image you want to reverse onto the solid image and then stamp the solid image stamp which has your stamped image on it onto your paper.. Now the print will be a little lighter so you'll want to touch it up with a pen. I found that smooth card stock and a pigment or VersaFine ink pad works the best for transferring. Once I had my images stamped I colored them in with Peerless Watercolors and fussy cut them out and set aside. Then on a piece of white card stock I stamped the water, grass & word bubble images. I colored he water in with my Copics B0000 & B0000 and then I used some Baked Brown Sugar & Garden Green ink for the grass using the Rock N Roll technique. I also added some shadows around the water edge with C0 & C1. I added the Monster heads down with some dimensioanls and then added some Clear Wink of Stella to both of them and a small Enamel Heart to the heart in the Love bubble. This hard for me to leave as is and just add it to a Black card base. I really wanted to add some other embellishments but nothing was working. 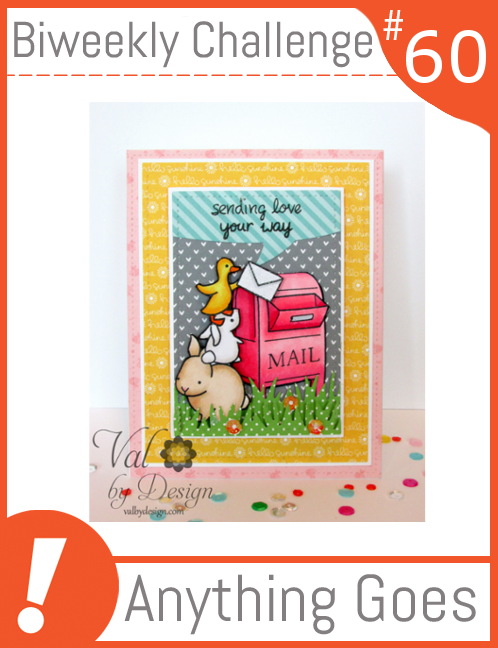 Be sure to stop by the Alley Way stamp Blog and see what other fun projects are being showcased today and Bonnie has a fun stamp set you can win! We're still celebrating our Birthday all month long so Link up with your projects created with the Alley Way Stamp products and you could win! I'm entering this into the Anything Goes #60 challenge over at MarkerPop!! I just LOVE that Alley Way stamp set (well, I love AW stamps, period! ); what a sweet, cute card! Thank you so much for joining us over at the MarkerPop Challenge blog!